Sports medicine is a practice of medicine centered around the care of athletes from the high school, collegiate and professional levels, as well as recreational athletes who enjoy getting active on the weekends. All sorts of physical activities may cause an athlete to become injured or experience pain while playing sports. When this happens, Dr. Steven Moalemi offers expertise in the sports medicine field. By treating athletes who live or work in Manhattan and the other city boroughs, Dr. Moalemi is able to help any athlete return to their favorite sport or activity with the goals of full function and with a minimal amount of down time. Dr. Moalemi’s practice is centered around the prevention of sports injuries. By helping patients with proper training techniques and educating them about correct form and posture, Dr. Moalemi can help athletes prevent injuries or avoid a recurrence of a problem that has already been treated. Whenever possible, Empire Physical Medicine & Pain Management uses non-invasive forms of treatment. These techniques include the use of night braces, supportive footwear and practicing of stretches that help to loosen tight muscles that would otherwise be prone to injury. When combined with physical therapy and regular stretching, these techniques can help to keep an athlete playing without pain or disruption to their athletic schedules. Patients can have all of their imaging done right in offices, with ultrasound, x-ray and CT scanning available. This allows for the prompt care of common sports and athletic injuries such as tennis elbow, Achilles tendon injuries, tears of the meniscus or rotator cuff, shoulder dislocations and fractures. Dr. Moalemi also offers treatment for tendinitis and sprains that can help avoid worsening injuries and the need for surgery later on. When surgical treatments are needed in order for a patient to enjoy a full recovery from a sports related injury, Dr. Moalemi uses the latest in microsurgery techniques. These procedures include small incisions with minimal amounts of scar tissue formation. Some of the most common surgical treatments performed by Dr. Moalemi include cartilage repair and restoration, ligament reconstruction, joint arthroscopy, meniscus repair, tissue allografts and transplantation, pectoralis muscle repair and patellar instability surgery. The doctor also performs state-of-the-art shoulder, knee and hip replacements. 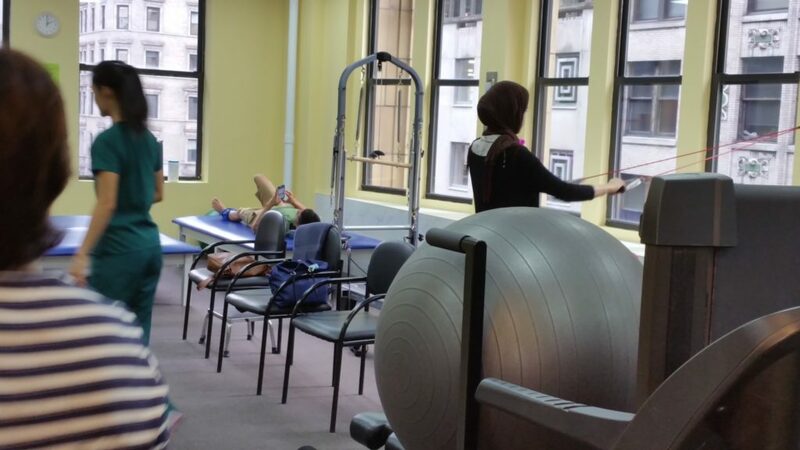 The clinic is conveniently located in Midtown Manhattan and it includes physical therapy and rehabilitation care for post surgical needs. Contact the scheduling staff to make an appointment for sports injury diagnosis and care with Dr. Moalemi today.